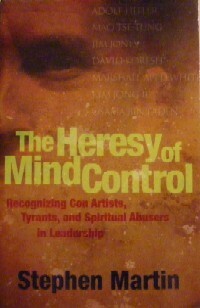 Mind control. Brainwashing. How are these used by con artists, terrorist recruiters, tyrants, authoritarian religious leaders and cult leaders? Stephen Martin has made an in-depth study of this topic and has written this book to help his readers understand the tactics and methods used by these deceivers to control their followers. Could you be deceived? Scams and con artists abound in our day. Deception can lead to entrapment, which leads to loss of independence and freedom, and this can lead to tyranny which we see in certain nations and in all terrorist groups. There is even tyranny – often subtle forms of it – in certain religious groups that appear to be good and harmless to those on the outside. And for those on the inside, it is not easy to just leave the group. When a leader and a group fall into the patterns of mind control, they pose a serious danger to those without knowledge about its dynamics. This book declares the truth about this insidious process so that those exposed to it can regain and maintain their own freedom of mind and spirit.